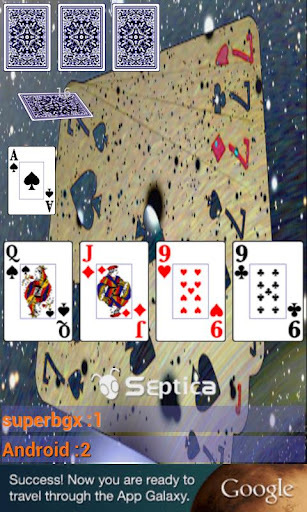 Septica by BGX Interactive is the most popular Android card game from Romania, it is simple, fun and addictive. It is perfect when you have to wait a few minutes, you can play it everywhere. 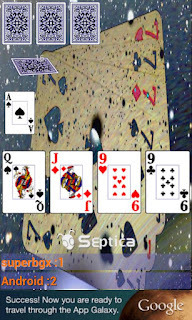 Septica's rules are simple and straight forward and you can compete directly from your Android phone (or table). The game also offers a very challenging AI, so you will have to be very careful on how you play (or you just might lose). 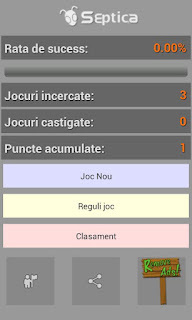 Septica also does a great job showcasing Swarm's social features. There are plenty of unique achievements to strive for as well as global leaderboards that enable players to compete with their friends from anywhere in the world! Sedma and Şeptică are Czech and Romanian for seven and little seven, respectively (referring to the wild cards), and zsírozás is Hungarian for to fatten (referring to the play of aces or tens into tricks). This game may have originated in Hungary or Poland and found its way to Czechoslovakia in the middle of the 20th century or it may have come from Russia It quickly became one of the most popular games in the country. 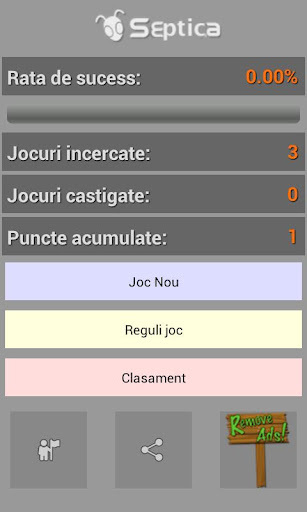 Check out the Romanian card craze and download Septica!